Pressurerised water container kit with hose & quick release coupling. Diamond core bits need a small but constant supply of water to cool down the diamond segments & to flush away slurry. Where water is available, taps can be used and water flow can be regulated on the tool, however on sites where there is no easy access to water supply, we recommend the Xcalibre water kit which includes a pressurised water container and hose with quick release coupling (QRC). 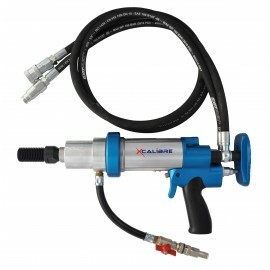 Xcalibre pressurerised are compact, easy to use and built for professional Concrete and Asphalt coring. To core, the pump is used to pressurise the tank. All seals are of highly resistant material and tolerate most mineral- based products. Over-pressurising the tank is not possible.